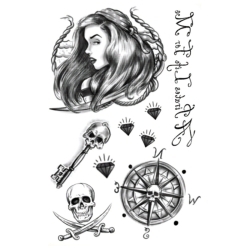 The Scallywag Pirate temporary tattoos feature an assortment of pirate themed tattoos and are perfect for pirate and sailor costumes. Temporary tattoos are a great way to add a touch of authenticity to your costume. They are easy to apply, easy to remove, and non-toxic. The tattoo measures 5.5" tall by 3.5" wide.